NEW YORK—The National Lawyers Guild (NLG) is in solidarity with the migrants’ rights group Pueblo Sin Fronteras (PSF), following an arson attack targeting their director, Irineo Mujica, yesterday. Last month, the NLG International Committee sent a delegation to Tijuana, Mexico to document human rights abuses and violations of international law surrounding the treatment of migrants. The delegation met with Pueblo Sin Fronteras, including Mr. Mujica, who described at length repeated harassment, intimidation, and even death threats against PSF members both online and in person in Tijuana. In addition, they and other human rights defenders described arbitrary arrests and violence by Tijuana municipal police targeting them for their work supporting migrants, and hours-long interrogations and detentions by US Customs and Border Protection authorities. As their press release (which we have translated to English below) states, “Pueblo Sin Fronteras considers this attack against our colleague as a direct result of the irresponsible campaign of hate, criminalization and defamation that has been promoted by the Mexican and United States governments, and other public figures.” PSF also cites the covert US-Mexican watch list of journalists and activists that was leaked last month as a concrete example of such criminalization campaigns. The NLG joins PSF in their call to stop the targeting and surveillance of migrants and human rights defenders. The NLG delegation will be issuing a report on its findings shortly. 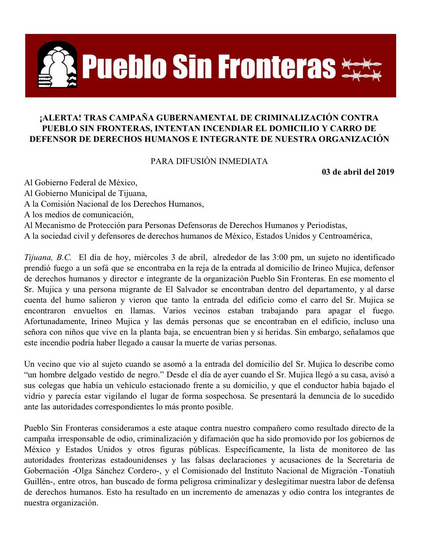 Original April 3 press release issued in Spanish by Pueblo Sin Fronteras. Click image for the full original post. 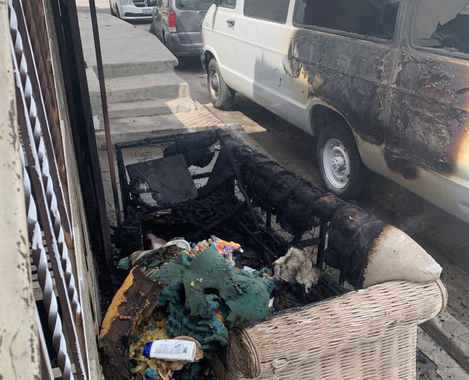 April 3, 2019, Tijuana, Baja California—Today, Wednesday, April 3, around 3 PM, an unidentified person set fire to a sofa located outside the home of Irineo Mujica, human rights defender and director of the organization Pueblo Sin Fronteras. At that time, Mr. Mujica and a migrant from El Salvador were inside the apartment, and evacuated upon realizing the smoke, finding that both the entrance to the building and Mr. Mujica’s car were engulfed in flames. Several neighbors worked to put out the fire. Fortunately, Irineo Mujica and the other people who were in the building, including a woman with children living on the ground floor, were not harmed. However, this fire could have caused the death of several people. Pueblo Sin Fronteras considers this attack against our colleague as a direct result of the irresponsible campaign of hate, criminalization and defamation that has been promoted by the Mexican and United States governments, and other public figures. Specifically, the list of journalists and activists by US border authorities and the false statements and accusations of the Secretary of the Interior-Olga Sánchez Cordero, and the Commission of the National Migration Institute, Tonatiuh Guilleén, among others, have sought to criminalize and delegitimize our work defending human rights in a dangerous way. This has resulted in an increase in threats and hatred against members of our organization. On Saturday, February 2, 2019, for example, the Pueblo Sin Fronteras Facebook page received a series of threats by a “Alejandro Uchiha,” whose Facebook account reveals resides in Tijuana. He said, “Die all you motherf*ckers,” “I’m a Tijuana resident and I have guns and I’m dying to shoot them at invaders!” and “So you know, I’m going after the heads of all the members of this damn organization and the devil pueblo sin frontera and Irineo mújica, that human garbage, I will cut off his balls and bring them to you” [sic]. There have been many threats like that. In addition to being victims of arrests and arbitrary detention by the Mexican government, being interrogated for hours without any cause by United States immigration authorities, many Pueblo Sin Fronteras members have received phone calls, text messages, emails and even personal threats against us. This campaign of criminalization puts our lives at risk, and today this reality has made itself clear. We request, once again, that the federal government of Mexico safeguard the security of human rights defenders and stops this criminalization campaign. Further, we request that the government do the responsible thing and investigate public figures that have contributed in an extremely irresponsible way to the defamation that has generated concrete acts of hate. Stop the criminalization of migration! Stop now the criminalization of human rights defenders! Featured image: Photo of the aftermath of the fire outside PSF director Irineo Mujica’s home. Posted in Press Releases and tagged Central American Exodus, Mexico, migration, NLG International Committee, surveillance.